I’m just back from a date with Dracula, and what’s more, he kissed my hand. He’s a pretty nice guy, this Dracula. Doesn’t scare kiddies and old ladies out of their skins, unless he gets paid for it. He has a soft voice and his blue eyes crinkle at the corners when he laughs. Out in Hollywood, where he hangs out when he isn’t making a career of giving folks the heebie-jeebies, he’s known as Bela Lugosi. But to most people, Bela and Dracula are one and the same, because it was in the Dracula film in 1927 that he made a name for himself in this country. Since then, he has tried his best to live down the reputation. Once he was cast in Frankenstein Meets The Wolf Man. Bela was the former. But in St. Louis, he has discarded his monster roles. He’s just a nice, old, insane gent with a record of a dozen murders, more or less. You know, the wholesome type. 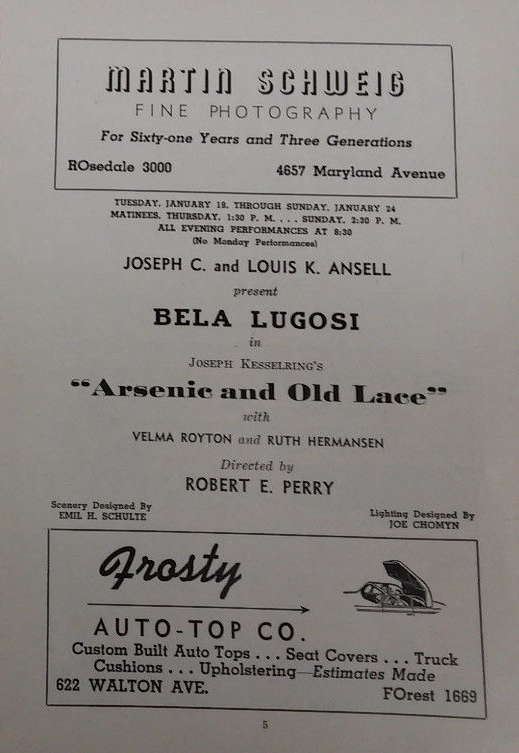 Lugosi stars in Arsenic & Old Lace, this week at the Empress Playhouse. To talk to him, you wouldn’t have any idea that he’s a pioneer in the horror picture field. He looks more like a banker, which his father was, or a statesman, which he dreamed of becoming before the theater got him. But once he had said his first line, he was in it for life. That’s just the way it was in his native Hungary. You showed you had talent, so you went to school for four years to train for the state theater. You made good as a freshman or you didn’t come back for your sophomore years. But once you graduated, you had a lifetime job with guaranteed roles, a paid vacation every year and a pension when you were too old to go on stage. Recognized in his 20s as one of Hungary’s most talented young actors, Lugosi studied at the Academy of Theatrical Arts and later become one of the leading members of Hungary’s National Theater. He made his stage debut as Romeo in a Hungarian version of the Shakespearean play, and followed that with other roles from Shakespeare, Ibsen, Rostand and Molnar. His career was interrupted by World War I, and after military service, unhappy over the threat of Communism in his country, he came to America, not knowing a word of English. Even now, more than 30 years later, his voice bears a marked trace of European heritage. 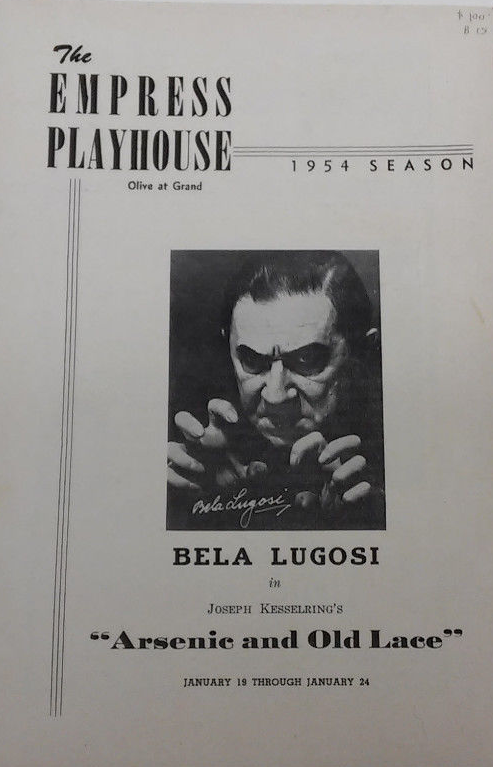 The play lasted only 6 weeks, but Lugosi won more than his share of glory in his debut and other offers were forthcoming in a hurry. He appeared in three other Broadway roles, Arabesque, Open House and The Devil in the Cheese, before he had the chance to appear in Dracula and a new chapter in his life began. Once started in his career as a horror specialist, he couldn’t escape. The role of the vampire bat made him a star overnight and he then appeared in such pictures as Chandu the Magician, The 13th Chair, and The Black Cat. With all its gold and glory, Dracula brought Lugosi some headaches too. For a few years he was riding the crest, then the fad faded and his career seemed doomed. In the late ’30s, the picture was revived and when crowds stood in line until 2 am to see it, producers realized people still were willing to be scared silly and pay good money for it. So Bela’s Hollywood stock took a sharp turn upward, and since then he has been kept busy giving audiences the jitters. Those times of unemployment, though, made him long for a state theater here as in Hungary. “The theater here is a gamble, a shoestring existence,” he said. “It requires great sacrifices of which the audience isn’t aware. The audience sees the 5% of the actor’s life on stage, not the 95% spent in preparation.